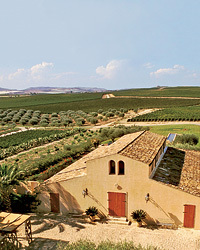 The 800-acre Feudo Principi estate in southern Sicily is one of 11 estates owned by Italy’s Veneto-based Zonin family. It’s the source of a number of good wines, among them this inky, rosemary-scented Nero d’Avola. This Sicilian winery is run by four relatives—Antonino, Giuseppe and Vincenzo Melia and Francesco Vallone—who produce a range of potent reds. Their most affordable is Scurati, an earthy Nero d’Avola with black fruit and robust tannins. Donnafugata—which means “woman in flight” in Italian, more or less—refers to Queen Maria Carolina, who fled Naples in the early 1800s. She took refuge near the estate vineyards in Sicily that produce this juicy Nero d’Avola. Sisters Marilena and Daniela Barbera are the winemaking talents behind this full-bodied, licorice-inflected red. Full of ripe cherry fruit, it comes from the Barbera family’s estate vineyards located in the southwest of Sicily, only a few miles from the ocean. Star Italian winemaker Riccardo Cotarella works for this southern Sicilian winery, and his touch is evident in wines like Morgante’s basic bottling. Purple-red in color, with lots of juicy boysenberry fruit, the wine finishes with a burst of peppery tannins.